You might have seen the Hami Hill Home before, but we’re planning so much more for the open this Autumn! Head on down for a short (but jam-packed) tour through the house and stay as long as you like to attend some of the fabulous workshops we’ll have going on. $15+ gives you access on the day and you can stay all day if you like! Come for a tour with Chris to cover the basics of the home, then stick around and learn from our experts about the topics most relevant for you. You’re welcome to stay all day if you like! Purchase entry online and go in the running to win n a home consult with Chris Ferreira for your property! Valued at $500. 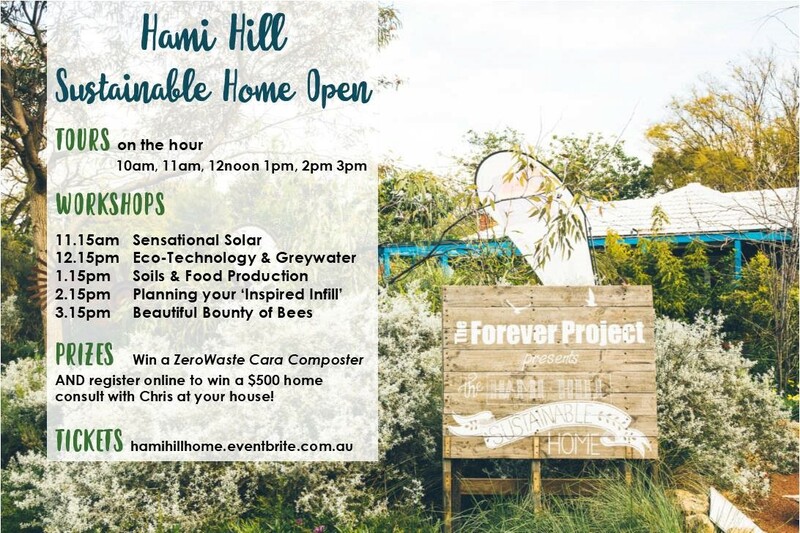 We’ll also be giving away a ZeroWaste CARA benchtop composter on the day! Look out for the entry forms. Chris will be running tours on the hour; 10am, 11am, 12noon, 1pm, 2pm and 3pm. We’ll start out the front in his fabulous native and waterwise garden, head through the house and out the back to his nature-play inspired and productive backyard. From rainwater tanks, to super energy efficient LED lighting to re-gasing your Air Con to slash running costs, Ken Higgins from Complete Enviro Solutions is a wealth of info on how you can slash your power bills with some nifty gadgets and appropriate technology. Learn the secrets of really amazing life giving compost, how to get the best out of your efforts and the tips and tricks the experts use to grow beautiful, nutritious and organic food in your own garden. This is essential for anyone who has battled to get the growth they hoped for in our depleted and tired sandy soils. Let the team from the Hamilton Hill Sustainable Home introduce you the tips and strategies to consider as you begin your own eco-infill project. A fascinating entry level talk into what is involved in this exciting new space of urban development from the basics of planning, passive solar design to the benefits of Strata development. A critical first step for anyone considering an alternative to typical infill development. Come and learn the tips and techniques for successfully having your own backyard bee hive from our local bee man and all round champion Vince. Vince has managed the hive at the Hamilton Hill Sustainable Home for 3 years and has a wealth of experience from all around the state on how to make for a healthy, happy and productive bee collective. A must for all those inspired by the thought (and taste) of having their own urban honey!